Iran has accused Israel of “committing state terrorism” and knowing “from the beginning” the perpetrators of 1994 suicide attack at the main Jewish community in Argentina after Israel’s former envoy claimed it killed those behind the violence. The condemnation comes from the Iranian Foreign Ministry in response to a statement by Israel’s ambassador to Argentina from 1993-2000, who claimed that many of those involved in the bombing of the Argentine Israelite Mutual Association almost 20 years ago had been targeted by Israel. “We still need an answer [from the Argentine government] on what happened,” Aviran said. “We know who the perpetrators of the embassy bombing were, and they did it a second time,” he added, in an apparent reference to the 1992 bombing of the Israeli Embassy in the Argentinean capital, in which 29 people were killed. “The statements are a clear confession of committing state terrorism by the Zionist regime [of Israel],” Afkham said late on Wednesday, Press TV reported. Based on Israel’s former envoy comment, Iran suspects that “Israel was well aware of the identity of the perpetrators from the beginning. To conceal the identity of the perpetrators and the facts surrounding this crime,” Israel eliminated them, Afkham said. Although Argentinian investigators identified the bomber as Ibrahim Hussein Berro, an operative of the Iranian-backed Hezbollah terror group, Iran accused Israel of framing Iran for the suicide attack and for hiding the truth over the past two decades. Allegations surfaced earlier this year that Iranian President Hassan Rohani was in some way connected to the decision to go ahead with the 1994 Argentine bombing, in which 85 died and 300 were injured. However, Argentinian prosecutor Alberto Nisman denied this information. Tehran has always denied any links to the bombing and in 2011 proposed talks with Argentina to start "shedding light" on the case. 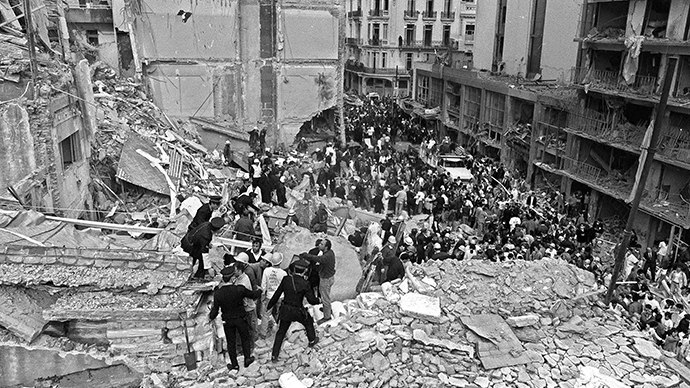 Argentina has come under fire, including calls for sanctions by members of the US Congress, after it signed an agreement with Tehran to establish a “truth commission” to investigate the 1994 AMIA Jewish center bombing.